A winter storm that could cause significant power outages is forecast for parts of the Rocky Mountain foothills and the High Plains. 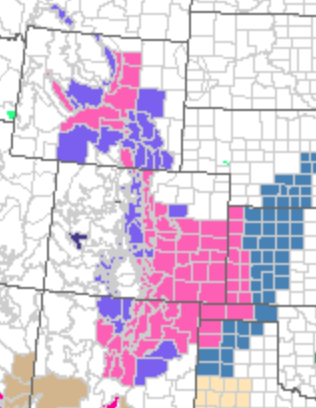 The pink is a winter storm warning. The purple is a winter storm storm advisory which is a lesser condition. The dark green is a winter storm watch. There is also a serious risk of flooding developing over the next few days. The greens are various types of NWS flood forecasts and warnings. 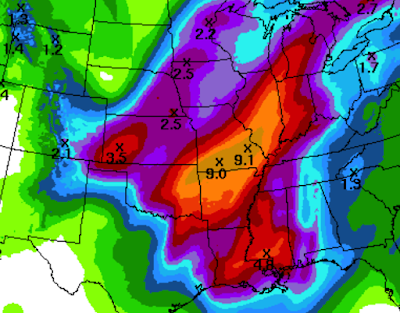 Additional rainfall will be very heavy. More than nine inches is likely to fall over the next four days. From Tulsa to St. Louis and points southeast need to be prepared for the possibility of serious flooding developing early next week.